The Official Community Plan (OCP) Review is about shaping the future of West Vancouver: how housing needs can be met, where shops, services and community facilities are located, how we move around, how we can protect the environment and how we respond to climate change. In early 2017, the District began a collaborative review of its 2004 OCP. Over the course of 2017 and 2018 through a four-phase public engagement process, staff worked with the community to develop a plan for the future of West Vancouver. The Official Community Plan was adopted by Council on June 25, 2018. We want to thank everyone who contributed their time and ideas to the process of planning for the future of West Vancouver. After four phases of community engagement, including over 100 events and meetings, over 1,000 surveys and submissions, and a review process that included approximately 4,500 instances of engagement, the Official Community Plan was adopted by Council on June 25, 2018. Community Wide Directions The updated higher-level District-wide objectives and policies. Schedule i: Regional Context Statement Describes the relationship between the proposed OCP and the Regional Growth Strategy. Schedule ii: Area-Specific Policies & Guidelines Existing local area plans, built-form guidelines, and environmental permit controls. Schedule iii: Glossary Descriptions of some of the plan’s terminology. We've prepared a two-page summary of the Proposed Official Community Plan that outlines its objectives, targets and key policies for the future. The adoption of the Official Community Plan triggers further, more specific community consultation to update West Vancouver’s Local Area Plans. Local Area Plans will be developed for Ambleside Town Centre, Horseshoe Bay, Taylor Way and Cypress Village. Each of the Local Area Plans will have their own comprehensive public consultation process. Phase 4, Plan, of the Official Community Plan review has been completed. Phase 4 included a number of consultation opportunities, public meetings and Council adoption of the Official Community Plan. We thank everyone who participated in one of the various public engagement events in Phase 4 (Draft Plan) and for contributing their feedback on the future of West Vancouver. Bylaw Introduction and First Reading: The Proposed Official Community Plan Bylaw received First Reading at the May 28, 2018, Regular Council Meeting. Public Hearing: A Public Hearing for the proposed Official Community Plan Bylaw was held on Monday, June 18, 2018. Second and Third Reading: Following the close of the Public Hearing, the Proposed Official Community Plan Bylaw received Second and Third Readings at a Special Council Meeting on June 18, 2018. Video of the Public Hearing and Special Council Meeting is available. Adoption: The Official Community Plan Bylaw was adopted at the Monday, June 25, Regular Council Meeting. The adoption of the Official Community Plan will trigger further, more specific community consultation to update West Vancouver’s Local Area Plans. Local Area Plans will be developed for Ambleside Town Centre, Horseshoe Bay, Taylor Way and Cypress Village. Each of the Local Area Plans will have their own comprehensive public consultation process. A community meeting on the proposed Official Community Plan was held on Thursday, May 10 at Sentinel Secondary School. Thank you to everyone who attended. Public engagement has shaped all phases of the Official Community Plan Review. In Phase 4, beginning in February 2018, the community was asked to provide input and feedback on a Draft OCP. Phase 4, Plan, launched with the release of a Draft Official Community Plan to the community for review and input. A range of consultation opportunities was provided to the community from February to March. Analysis and a transcript of all feedback received is presented in the section above. In Phase 4, we produced an informational video and visual summary of the Draft Plan. For more information, review the materials below. Public engagement for Phase 3: Directions of the Official Community Plan review has been completed. We thank everyone who participated in one of the various public engagement events in Phase 3 and for contributing their feedback on the future of West Vancouver. In Phase 1 we asked about your Objectives and in Phase 2 you gave us your Ideas to make them happen. Phase 3 was about the directions that have emerged from citizen input into the process so far, and taking deep dives into the five Official Community Plan topics: Housing & Neighbourhoods, Transportation, Local Economy, Parks & Environment and Social Well-Being. We would like to thank everyone who participated in Phase 3 of public engagement for the Official Community Plan (OCP) Policy Chapter Review and shared their ideas for the future of West Vancouver with us! A Public Engagement Summary Report that summarizes the feedback and input we received from the community during Phase 3 is now available. A Directions Paper is created for each topic. These resources present the Directions that have emerged from the process to date and were used to inform Public Engagement in Phase 3. Public engagement for Phase 2: Ideas of the Official Community Plan review has been completed. We thank everyone who participated in one of the various public engagement events for contributing their ideas and energy to the future of West Vancouver. Phase 2 focused on developing Ideas for how the District could advance or meet the Objectives that emerged from Phase 1. The community will then be engaged in turning these “Ideas” into topic-specific “Directions” that will then form the basis for policies of the Draft Plan. Staff will be providing an Official Community Plan Review status report and outlining next steps in the process to Council at their October 16 Council Meeting. We would like to thank everyone who participated in Phase 2 of public engagement for the Official Community Plan (OCP) Policy Chapter Review this summer and shared their ideas for the future of West Vancouver with us! A Public Engagement Summary Report that summarizes the feedback and input we received from the community during Phase 2 is now available. Planning staff held Pop-Up Planning Offices throughout August at the West Vancouver Memorial Library, Gleneagles and West Vancouver Community Centres. Thank you to everyone who came by and visited a Pop-Up Planning Office. Thank you to everyone that completed an Ideas Workbook. The submission process is now closed and we are no longer accepting Ideas Workbooks. Please contact us if you have any questions about your Ideas Workbook. Public engagement for Phase 1: Objectives of the Policy Chapter Review component of the Official Community Plan review has been completed. Having completed Phase 1, staff presented a Progress Report to Council at their regular meeting on Monday, June 19 and we have now moved into Phase 2: Ideas. West Vancouver has a tremendous opportunity to plan for its future through a review of its Official Community Plan (OCP) and the development of a robust policy framework to guide planning decisions. The review process will build upon the key principles and values of the existing 2004 plan, capture a decade of citizen working group input, and engage the community and stakeholders on emerging issues like housing, local area plans and climate change. The OCP review will provide a number of opportunities for citizen engagement throughout the coming year as various policies are reviewed and local area plans are developed. The OCP Review is made up of a number of components parts including a review of policy chapters and the development of local area plans for centres and corridors. Another component of the OCP Review is the preparation of Local Area Plans for centres and corridors. These are locations where growth and change can be anticipated and the process for each of these plans will vary based on the scope and unique conditions of each area. Marine Drive Local Area Plan and Design Guidelines: A Public Hearing for the Marine Drive Local Area Plan and Design Guidelines was held on June 5, 2017. The amending bylaw to adopt the Plan was adopted at a Regular Council Meeting on June 19, 2017. Please see the project webpage for details on the plan. Ambleside Town Centre: Pending conclusion on the Marine Drive Local Area Plan, work will begin on the Ambleside Town Centre Plan. The District has tremendous opportunity and need to plan to ensure that development in the decades to come supports the needs of current and future residents and businesses. Anticipated: 2016–18. Stay tuned for information about the launch of the Ambleside Town Centre Planning Process. Cypress Village: The recommendations of the Upper Lands Working Group will be used as a “framework” in preparing the Cypress Village Area Development Plan. The main private landowner in the Upper Lands, British Pacific Properties (BPP), has begun the “pre-application” phase for this project, which will be followed by a municipally-led planning process including a citizen Working Group. Upper Taylor Way Corridor: The Taylor Way corridor (from Keith Road to Highway 1) is a prominent gateway into West Vancouver, close to frequent transit and commercial services. Recent land use changes along the corridor have seen new multi-family development and institutional uses (including a memory care centre) and this plan will look at the suitability of other land use changes to guide the future of this corridor. Anticipated: 2018. 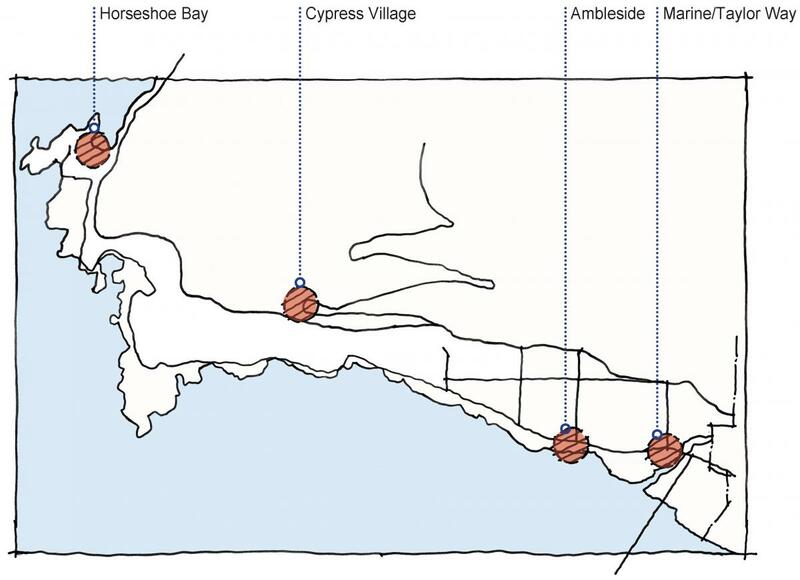 Horseshoe Bay: At its meeting on March 11, 2019, Council directed staff to commence the Horseshoe Bay Local Area Plan (LAP) process to create a new LAP for the area in accordance with an approved Terms of Reference. Please see the project webpage for details. Following adoption of the 2004 Official Community Plan (OCP), a number of citizen-led Working Groups were formed to respond to emerging issues and develop new plans and strategies. Significant community engagement occurred as part of these working group projects, which represent our community’s own ideas and objectives for the District. A key part of the OCP review will be to reflect as appropriate these various plans and strategies in a revised OCP to ensure this valuable citizen input is captured. Demographic, Housing & Employment Projections: Received by Council for Information on July 4, 2016. Housing Diversity and Affordability: Presented to Council on July 4, 2016 and will be used to inform Local Area Planning Processes and refreshed housing policies. Neighbourhood Character and Building Bulk: Zoning bylaw amendments for fence heights, on-site landscaping standards and lot consolidation regulations were adopted by Council June 6, 2016 and work will continue on additional regulatory changes through the fall/winter of 2016. Formation of a Tree Bylaw Working Group is currently underway. Ambleside Waterfront Concept Plan: Endorsed by Council for implementation and consultation June 13, 2016. What’s an Official Community Plan (OCP)? It's a community-wide land-use policy document that helps shape the future of West Vancouver. It includes policy chapters about housing, economy, transportation, parks, environment and social well-being. Why is the District reviewing it now? The current OCP was adopted in 2004 and the time is right to review it to ensure the community has a planning tool to address the challenges of today and tomorrow. Because the OCP is the District’s number one planning tool for the next five to ten years, and because it touches citizens’ lives in some way every day: how housing needs can be met, where shops, services and community facilities are located, how we move around, how we can protect the environment and how we respond to climate change.